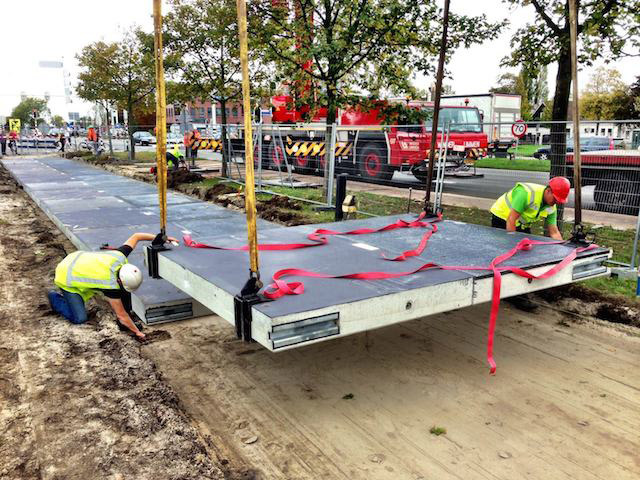 Netherlands, in an initiative to scale up the use of renewable energy, has today opened up the world’s first road made up of solar cells. The Netherlands Organisation for Applied Scientific Research and the Dutch province of North Holland collaborated to construct a 230-foot stretch of the project, dubbed ‘SolaRoad’. The stretch of the solar lane is protected by two layers of safety glass and will be used by 2,000 cyclists every day to commute between the Amsterdam suburbs of Krommenie and Wormerveer. According to the researchers behind this project, this 230-foot stretch can generate enough energy to power about three Dutch homes. It is not much, however, the project’s creators are viewing this initial stretch of road as a test — if all goes well, they hope to further test this project on small roadways and in bike lanes. Over the next three years, researchers will be conducting tests and measurements to determine how much energy the road produces and how it holds up to an onslaught of daily bike commuters. They also hope to extend this initial SolaRoad to 328 feet by 2016. In general, solar roads do not produce a huge amount of electricity as solar panels can not be adjusted according to sunrays to maximise exposure. However, solar roads are a practical alternative electricity source for urban cities where there is lack of large tracts of land. The country recently began planning for a 48-turbine wind farm that is expected to be completed by 2016 and will generate enough electricity to power about 160,000 households. The wind farm will contribute to a Dutch goal of having 6,000 MW of onshore wind energy by 2020. One town in The Netherlands is also harnessing the power of the ocean to provide heat to its residents.